When Julie Cawood and Chris Thompson announced their imminent retirement, there was concern the future of a business which has been the centrepiece of a Yorkshire market town for 21 years could be in jeopardy. The Fruit Basket on Boroughbridge High Street is a quintessential country store, and has featured in countless images and films taken by tourists and professionals alike, trying to capture the nature of a traditional British town. 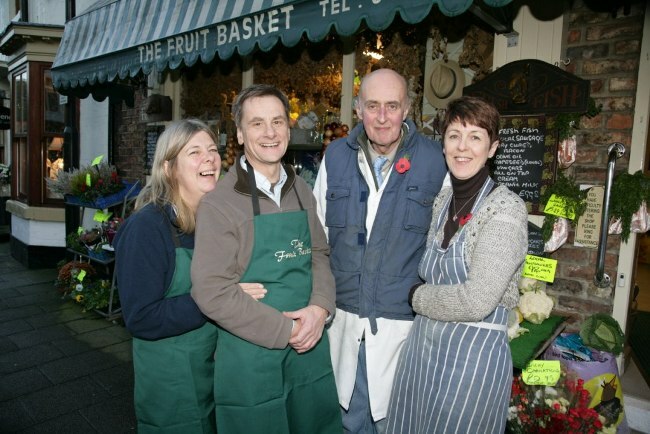 But Boroughbridge has been breathing a sigh a relief after it was confirmed this week that local couple Sharon Longcroft and Hugh Fink have acquired the business and are to become the new faces behind the Fruit Basket counter. “Boroughbridge is remarkable in that the town centre is occupied almost exclusively by small, independent retailers and, when we heard the Fruit Basket was on the market, our first thought was that it would be a shame if one of the most iconic ones was to disappear. Since then, Sharon and Hugh have invested time and effort in learning more about the logistics behind running a thriving fruit and veg store – a significant change in direction for both. Hugh has worked in engineering for 31 years, most recently as a sales account manager with one of the largest firms in the rail sector, while Sharon runs Boroughbridge-based Poplar Framing as well as Artists and Artisan events, giving the region’s artists an opportunity to exhibit their work. Hugh will be leaving his current job while Sharon’s businesses will relocate to a home studio a short distance from the store. “It’s an exciting time for both of us. I would certainly hope to see a lot of faces I already know – but the Fruit Basket is a completely different challenge. “Of course, we want to maintain its reputation as a small and friendly fine food store, but we also have to develop our own relationships with a network of suppliers. The Fruit Basket will also become part of the Love Boroughbridge cooperative, launched last month by the traders to promote the town as a retail destination – and subsequently praised nationally by Cooperatives UK as an example of good practice. “We accept, when it comes to competing with the big high street names, it’s hard for small independent retailers to be heard. We’re stronger together and we hope Love Boroughbridge will give us a voice. Sharon, Hugh, Chris and Julie outside the Fruit Basket.